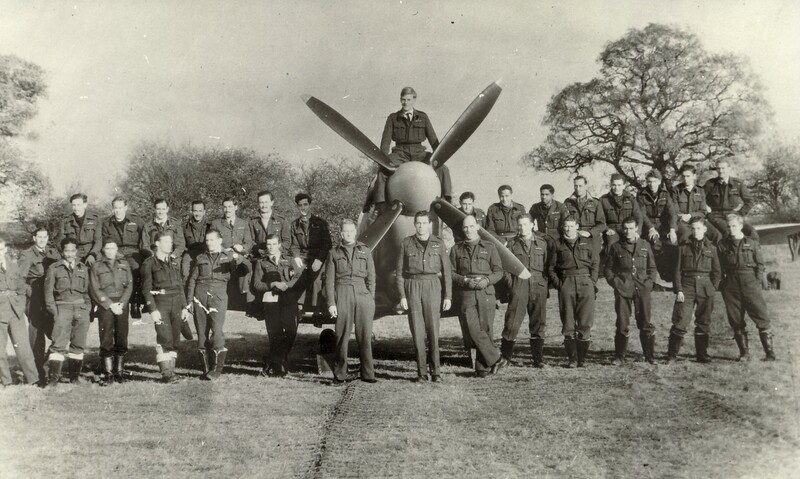 Educated at QRC; nickname “Sonny”; Volunteer Trinidad ETS, trained at Piarco; Martinet HP321 of 1690 Flight, RAF Scampton, piloted by Graham with LAC Lewis on board encountered engine failure and force landed at Hicknall aerodrome. Graham killed instantly, Lewis died in hospital – Son of Ambrose Nathaniel and Francisca Graham, of Bpasso Piedpa, Trinidad. Additional information: Son of Ambrose Nathaniel and Francisca Graham, of Bpasso Piedpa, Trinidad. Grave/Memorial Reference: Sec. D. Grave 7A. 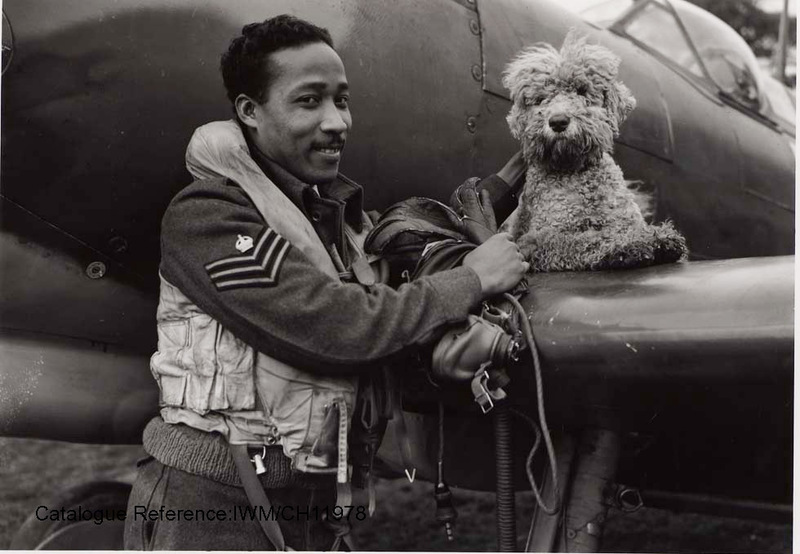 Flight Sergeant James Hyde of San Juan, Trinidad, a Spitfire pilot who arrived in Britain in 1942 to begin his training, here pictured in 1944 with his Squadron’s mascot, a dog called ‘Dingo’. He is wearing a life jacket, known universally as a Mae West, and is holding an oxygen mask and his flying gloves. Most air battles took place at altitudes in excess of 15,000 feet (c. 5000 metres) and oxygen and thermal protection were vital. 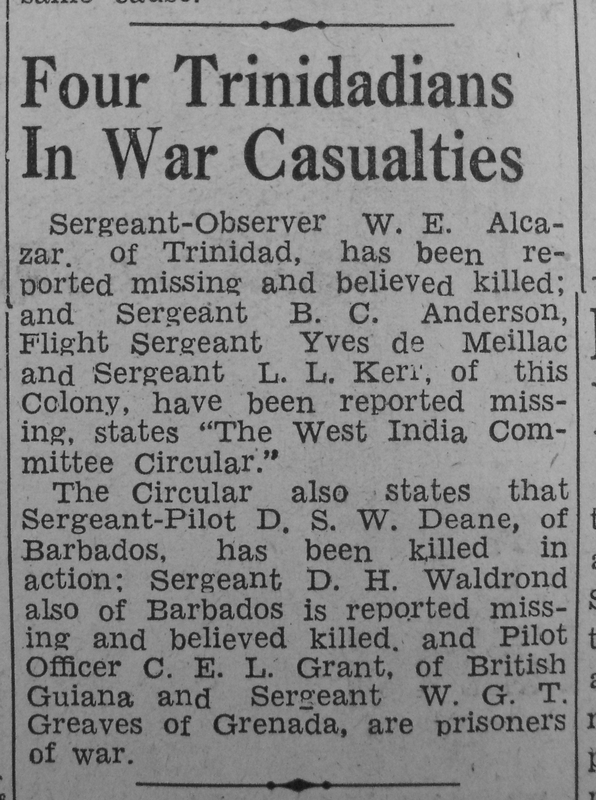 1391841 – Warrant Officer – Pilot – 132 Sqn – Spitfire IXE, PL316 – KIA at 27 Volunteer Trinidad ETS, trained at Piarco. 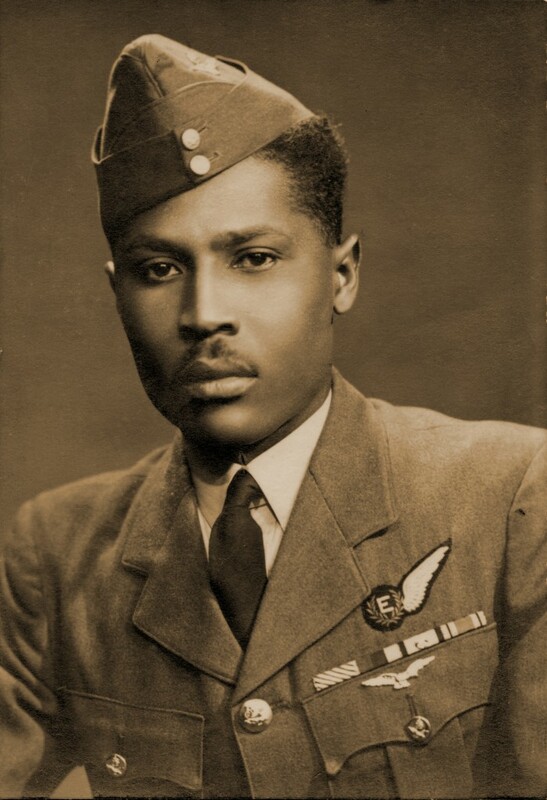 Took off at 1525hrs on 25 Sep 1944, tasked with providing aerial cover during the battle of Arnhem. Killed in dog fight over Nijmegan. Probably shot down by a/c of Jagdkorps II, probably I/JG26 or II JG26 which claimed 4 Spitfires each. See Top guns of the Luftwaffe, D Caldwell, pg 281. German a/c FW 190D-9 or Bf 109G-6. – Son of Joseph and Millicent Hyde, of San Juan, Trinidad. 3rd row: Sgt. Dunajewski, F/Sgt. Chute, Sgt. Hyde, Sgt. Bielicki, Sgt. 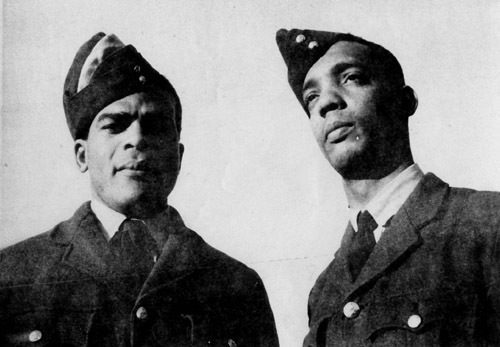 Ballantyne, Sgt. Bedowski. Combat Film No 73. Flying Officer Weekes of 132 Squadron on 21/12/1943 at 1200, flying Supermarine Spitfire IX. Target: Focke-Wulf Fw 190. Fragment No. 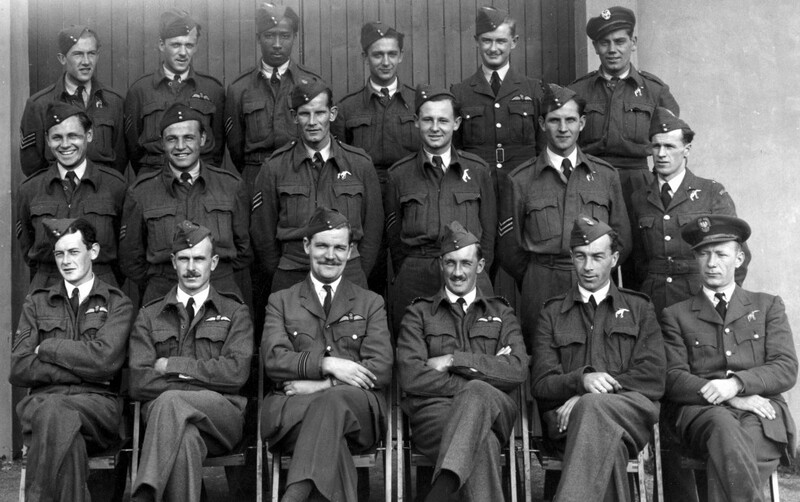 73 is at 8:00 minutes into the film, which features a number of fragments of 132 Squadron.